Should Detroit Make a Push for James Wisniewski? Earlier this month, I wrote about the possibility of Marek Zidlicky being a trade target for the Detroit Red Wings. It’s no secret that the team has been on the hunt for an offensively inclined, right-handed defender for quite some time now. I also discussed Dion Phaneuf’s availability, and if he and Detroit would be a good match. 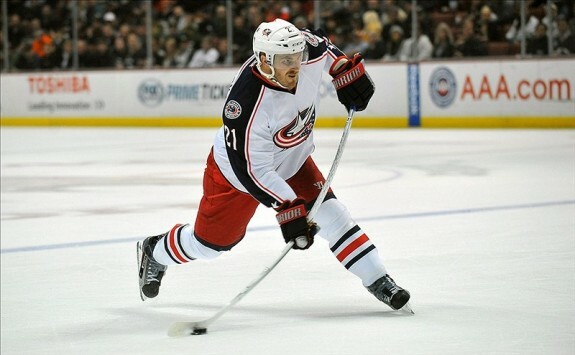 With rumors circulating that Columbus Blue Jackets defender James Wisniewski could be available, it is possible that Detroit may have found a more ideal target to pursue. Wisniewski fits several of the Red Wings’ needs on their blueline. He has a knack for getting his shot on net and would be a fantastic addition to Detroit’s already potent power play. The Canton, Michigan native’s numbers have dropped slightly this season – he has scored 27 points through 52 games. However, it’s probably fair to say that Columbus’ injury woes have played a part in the decline. Last season, Wisniewski put up 51 points in 75 games, which put him in eighth spot among defensemen for the 2013-14 season. Wisniewski also plays with a physical edge, something that Detroit could use a little more of on their back-end. His 92 hits through this season would put him in first for the Red Wings in that regard. Additionally, Wisniewski has seen time on the penalty kill in Columbus, playing an average of 1:51 per game. While Detroit has regularly used Kronwall-Ericsson and DeKeyser-Quincey as their PK pairings, it would be a bonus to have the option of using Wisniewski, should the need arise. Would Wisniewski Waive for Detroit? One possible hitch in this scenario would be his willingness to go to Detroit. Wisniewski has a limited no-trade clause, giving him the ability to create a list of ten teams, to which he would not approve a trade. Would Detroit be on his “do not trade” list? It’s unlikely, though Wisniewski has expressed a somewhat negative opinion toward Red Wings management in the past. Compensation is no longer an issue when it comes to Wisniewski becoming a member of the Red Wings – his contract with Columbus runs until the 2017-18 season. However, if Wisniewski was in talks with Detroit during the summer of 2011 and felt slighted by an offer made by the club, it is possible that he could be reluctant to accept a trade to the Wings. Overall, I believe that Wisniewski would accept a move to Detroit. The Wings are among the top teams in the eastern conference, and his compensation is in accordance with his standards. Would Ken Holland Pay Up? The biggest question is whether Ken Holland would be willing to pay the price in order to acquire Wisniewski. Certainly, if Blue Jackets general manager Jarmo Kekäläinen is considering moving the defender, he will seek out a solid return for him. Ken Holland is not looking to add depth on Detroit’s blueline, but rather a significant upgrade. Outside of the Washington Capitals’ Mike Green, Wisniewski is one of the few blueliners I would like to see Holland aggressively pursue. Taking on the role of armchair general manager, I would be willing to package Teemu Pulkkinen, Brendan Smith or Xavier Ouellet and a second-round draft pick in a trade for Wisniewski. While it may seem too much for Detroit fans, or too little for Columbus fans, I feel as if both sides would benefit from the trade. With less than one week left before the trade deadline, time can only tell whether Holland will stand pat or make one final push for an upgrade on defense.